Poison Mushroom artwork from Brawl. The Poison Mushroom (毒キノコ, Poison Mushroom) is an object from the Mario series, debuting as an item in Super Smash Bros. Melee. It looks similar to a Super Mushroom, differentiated only by a duller color scheme and angry-looking eyes. A Poison Mushroom as it originally appeared in the Japanese version of Super Mario Bros. 2. Poison Mushrooms made their first appearance in Super Mario Bros.: The Lost Levels, first released in Japan only with the title Super Mario Bros. 2. It is found in some ? Blocks and looks deceptively similar to a Super Mushroom, but touching it is equivalent to touching an enemy: Super Mario/Luigi is reverted to his smaller size, and small Mario/Luigi loses a life. Although Poison Mushrooms can look identical to a Super Mushroom, it is purple in numerous of its appearances outside of Smash. 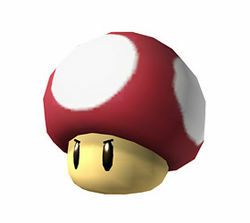 The Poison Mushroom's behavior is similar to that of the Super Mushroom, but with the opposite effect. It looks like a Super Mushroom, but the character will shrink rather than grow if interacted with. Makes the character smaller, which in turn significantly reduces the size of their hitboxes and hurtboxes. Somewhat reduces the fighter's weight. Increases the fighter's knockback taken multiplier. This consequently makes the fighter more vulnerable to attacks that have high base knockback values. Direct attacks deal less damage (by 0.6x from Brawl onwards, while the damage drop is less severe in Melee) and subsequently less knockback. Projectiles still deal their base damage amount, but they will be smaller and have decreased range during the item's effect. This also applies to some other unique attacks, such as Hammers. The base knockback and knockback growth values are not affected. Reduces the distance the character can throw items. Decreases the character's jumping height. Decreases the character's falling speed and air speed. Decreases the character's walking and dashing speed. Reduces the landing lag of the character's aerial attacks. Shortens the distance gained by the character's recovery moves in Melee. The character's sound effects and voice become higher-pitched and sped up. This does not affect gameplay. The transformation lasts about ten seconds. Touching another Poison Mushroom will reset the timer. Touching a Poison Mushroom while under the effect of a Super Mushroom and vice versa will restore a character to their normal size. The Poison Mushroom made its debut in this game with the above effects. Additionally, in the Special mode Tiny Melee, all the players are permanently under the effect of a Poison Mushroom. Poison Mushrooms made their debut in Super Mario All-Stars, where they'd cost characters a life if picked up. These nasty fungi are dark and foul-tasting, and in Super Smash Bros. Melee, they make you shrink on contact. With your diminished stature comes a loss of power and mass, making you a prime target to get smashed offscreen with even a light attack. In Super Smash Bros. Brawl, characters strike a pose while growing/shrinking, briefly lamenting their reduced size and relishing their return to normal. Most of the items held by the player, as well as their own projectiles, will be proportionate to their lower size. Certain attacks or charge ups can be interrupted if a Poison Mushroom touches the player in the course of doing an action. Tiny battles also return as a Special Brawl feature. In a Tiny Special Brawl, direct attacks deal around 0.48x their normal damage. The Poison Mushroom trophy in Brawl. A penalty item that shrinks whoever grabs it. It's hard to distinguish from a Super Mushroom, so you may find yourself getting small when you wanted to get big. When you're in miniature form, your attack power drops, and even the lightest attack can send you off the stage. That being said, a small target's hard to hit. Your best plan when you're tiny may be to run. The Poison Mushroom in Super Smash Bros. for Nintendo 3DS. The Poison Mushroom returns in Super Smash Bros. 4, keeping its prior behavior. Mini battles are once again available as a Special Smash option. In a Tiny Special Smash, fighters still deal 0.48x their normal damage with their direct attacks. If players acquire a Poison Mushroom in that game mode, their direct attacks will deal 0.34x their normal damage. In a Giant Special Smash, acquiring a Poison Mushroom lowers a fighter's damage multiplier to 0.92x. The Poison Mushroom is a red trophy item: when selected, it makes a chosen opponent start a battle under the effect of a Poison Mushroom. Using this trophy cancels the effect of a Super Mushroom trophy used by the target. The Poison Mushroom is one of the items that can appear during a Transformation Smash. The Poison Mushroom trophy in Super Smash Bros. for Nintendo 3DS. The Poison Mushroom trophy in Super Smash Bros. for Wii U. Becoming giant and looming over your foes is pretty great, yeah? Well, that won't happen if you get this mushroom. It looks a lot like the Super Mushroom, but it's a slightly different color and its face is... unhappy. If you use this mushroom, you'll shrink down and be easy to send flying. So, you thought you'd nabbed a Super Mushroom, eh? Nope! Now you're tiny! If you'd looked more closely, you'd have seen it was a slightly different colour - it was a Poison Mushroom. Now you're mini, weak and very launchable. At least dodging's not hard when you're this size! The Poison Mushroom returns once again as an item in Ultimate. Unlike Brawl and Super Smash Bros 4., Characters no longer strike a pose when they're shrinking or growing, making their animation similar of that to Melee. This also prevents certain attacks and animations from being interrupted when a player touches one. In Brawl, if Pikachu uses Quick Attack on a falling Poison Mushroom or Super Mushroom, it will perform the size change super jump. The Melee trophy of the Poison Mushroom states that the Poison Mushroom made its debut in Super Mario All-Stars, but its first appearance actually was in the Japanese version of Super Mario Bros. 2; this could be because Super Mario-All-Stars was technically the first game in the west to include the Poison Mushroom. This was later corrected in Brawl, using the western title of Super Mario Bros.: The Lost Levels. Conversely, Smash Wii U also lists Super Mario Bros.: The Lost Levels, however, like in Melee, it tracks its western appearance on "08/93", the release date for Super Mario All-Stars, rather than the original Japanese release date. While other items are usually designed to visually stay true to their home series in subsequent Smash titles, the Poison Mushroom is the only item from another series's universe that is deliberately given an original design for the Smash series. Here, it is visually similar to the Super Mushroom instead of the purple hue it is known for in recent Mario games. 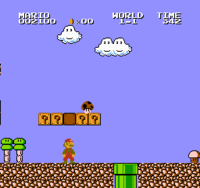 This is done as an attempt to confuse fighters, similarly to its original appearance in Super Mario Bros.: The Lost Levels in which it was a different color but does not look overtly threatening, disguising its deadly nature. Although being mini reduces one's ability to recover, certain up specials which are affected by a fighter's gravity stat will actually go higher as a result of the reduced gravity applied by the mushroom. This page was last edited on April 18, 2019, at 00:55.